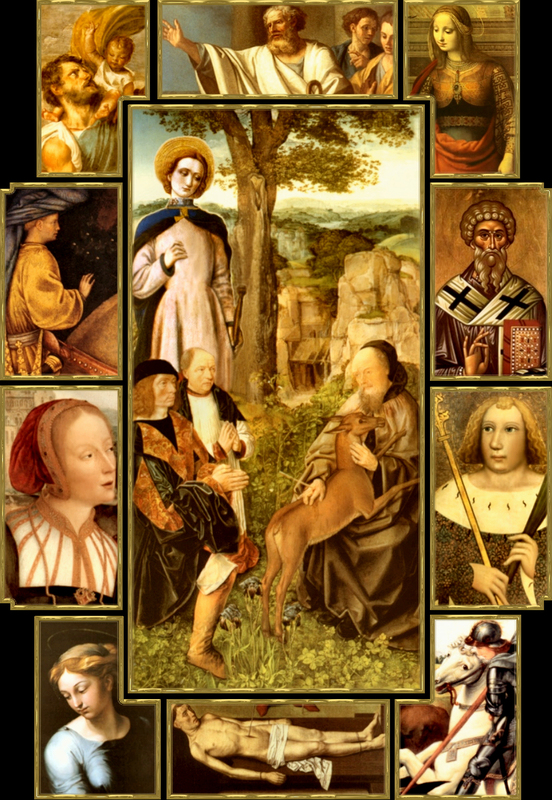 St. Erasmus [Elmo], St. Margaret, St. Barbara, St. Eustachius [Eustace]; center panel, left, from top to botton: St. Achatius, St. Cyriacus, St. Pantaleon; center panel, right: St. Giles [with the deer]. NOTE: The images of St. Achatius, St. Cyriacus, and St. Pantaleon are adapted from imagesof unidentified Saints' images of the time period. St. Joseph, helper in all needs, etc. All ye Holy Helpers, etc. Through the mystery of Thy holy incarnation, etc. That Thou wilt pardon us, etc. O God, who didst miraculously fortify the Fourteen Holy Helpers in the confession of the Faith; grant us, we beseech Thee, to imitate their fortitude in overcoming all temptations against it, and protect us through their irttercession in all dangers of soul and body, so that we may serve Thee in purity of heart and chastity of body. Through Christ our Lord. Amen. now in the enjoyment of His beatific vision in Heaven; because thou persevered till death thou gained the crown of eternal life. Remember the dangers that surround us in this vale of tears, and intercede for us in all our needs and adversities. Amen. Fourteen Holy Helpers, select friends of God, I honor thee as mighty intercessors, and come with filial confidence to thee in my needs, for the relief of which I have undertaken to make this novena. Help me by thy intercession to placate God's wrath, which I have provoked by my sins, and aid me in amending my life and doing penance. Obtain for me the grace to serve God with a willing heart, to be resigned to His holy will, to be patient in adversity and to persevere unto the end, so that, having finished my earthly course, I may join thee in Heaven, there to praise for ever God, Who is wonderful in His Saints. Amen. These Saints are invoked as a group, apart from individual patronage, because of the epidemic called the "Black Plague," which devastated Europe between 1346-1349. Among its symptoms were a turning black of the tongue, parching of the throat, violent headache, fever and boils on the abdomen. The malady attacked its victims without warning, robbed them of reason and killed them within a few hours, and many died without the last Sacraments. fear caused many attacks and disrupted social and family ties. To all appearances the disease was incurable. St. Christopher and St. Giles, plagues, St. Denis, headaches, St. Blaise, ills of the throat [although St. Ignatius of Antioch is also a patron of those with sore throats], St. Elmo, patron of abdominal maladies [and one of the several Saints having patronage over childbirth, which is not an illness, of course, as well as patron of sailors], St. Barbara, against fever, St. Vitus, [with St. Dymphna, against epilepsy], St. Pantaleon, patron of physicians, St. Cyriacus, recourse in time of temptations, especially at the hour of death; Sts. Christopher, Barbara, and Catherine were appealed to for protection against a sudden, unprovided death; the aid of St. Giles was implored for making a good confession; St. Eustace, patron of all kinds of difficulties, especially family troubles. Domestic animals were also attacked by the plague: Sts. George, Erasmus, Pantaleon and Vitus were invoked for their protection. St. Margaret of Antioch is the patron of safe childbirth deliveries [along with St.Gerard Majella and Raymond Nonnantus]. As devotion spread, Pope Nicholas V in the 16th century attached indulgences to devotion of the Fourteen Holy Helpers, which are no longer attached under the modern norms and grants, although their cultus is still efficacious and to be promoted.